The prusik (fig. 6-23) requires a few wraps of a light accessory cord around the climbing rope, and it's ready to go to work. The cord is usually a loop (sling) of 5-millimeter to 7-millimeter perlon, wrapped two or three times around the rope. Icy ropes or heavy loads require more wraps than dry ropes or light loads. The accessory cord must be smaller in diameter than the climbing rope, and the greater the difference in diameter, the better it grips. Webbing isn't used for prusik knots because it may not hold. Fig. 6-23. 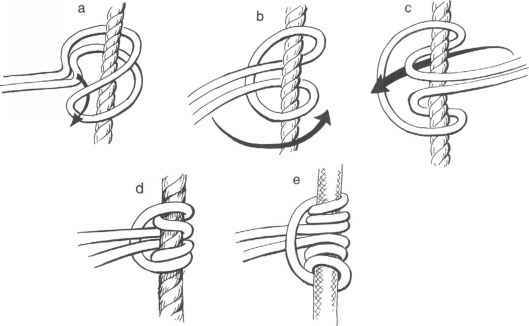 Prusik knot: a-c, tying sequence for the prusik knot; d, a two-wrap prusik knot; e, a three-wrap prusik knot. describes this process in detail as it is used in getting out of a crevasse.) 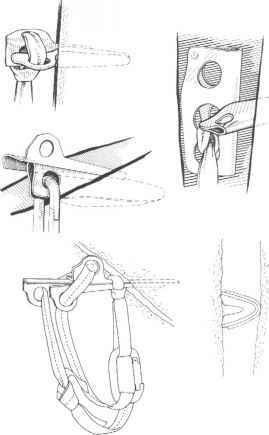 The knot is also used to help in raising and lowering people and equipment during rescues.